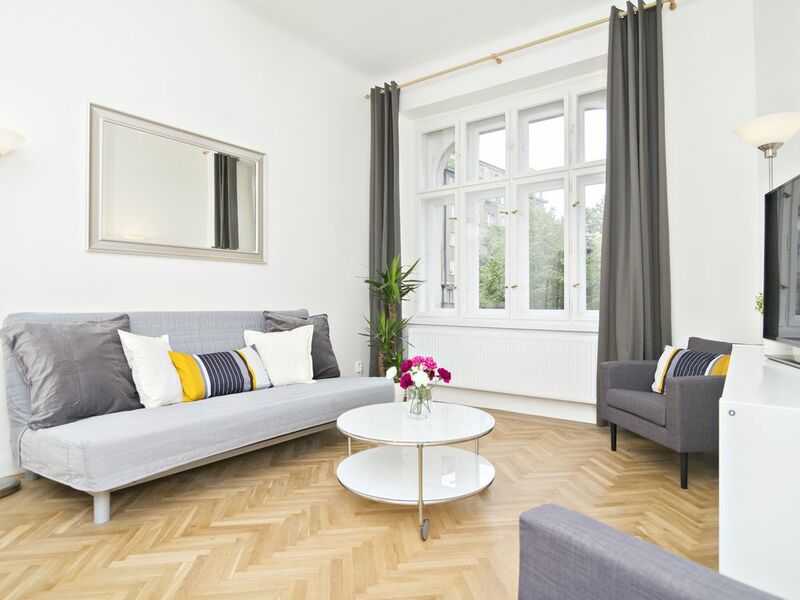 DALIA is a calm and comfortable apartment in the heart of Prague. It is only a 10 minute walk from Old Town Square, with a nice park view. Dalia apartment is cosy and provides enough comfort for 6-8 people. DALIA has 3 independent bedrooms, 2 bathrooms, a hall and a spacious kitchen with a big dining table and access to a small balcony. The kitchen is well-equipped with everything you need (coffee maker, microwave, toaster etc.) to make breakfast or dinner before and after a day in town. DALIA is a non-smoking apartment with the option of smoking on the balcony. If you want to get a better idea of the apartment layout, scroll down to view the floor plan. DALIA is a perfect choice also for a bigger groups as its independent bedrooms and two bathroom guarantee enough privacy and comfort. Moreover, DALIA is situated in the same building as our two other apartments, VINCENT and SMETANA. Vincent is big enough for up to 8 guests and Smetana is big enough for up to 7 guests. This way you will avoid arranging meeting times and looking for friends and family in a crowd of tourists. Perfect location, nice and clean apartment I recommend it! Dalia is an ideal apartment for your Prague vacation. Very spacious and spotlessly clean. We also booked RenteGo's driver to pick us up from the airport, which we would also highly recommend. RenteGo staff could not have been more helpful and accommodating from start to finish. We would highly recommend this apartment. Es war sehr außergewöhnlich für mich, dass der Schlüssel vorher zugeschickt wird, aber es war so bei der Anreise dann eine sehr bequeme Sache. Wir hatten eine angenehmen Aufenthalt in der Unterkunft und es war alles sauber und ordentlich. Es gab ein "Bad", wo ausschließlich eine Toilette drin war, welches ziemlich eng war und für Leute größer als 1,85m kaum benutzbar, aber es gab ja zum Glück noch ein Zweites Bad mit Toilette, wo alles super war. Außerdem war eine Schranktür in der Küche defekt, was beim ersten aufmachen einen Schreck gab, da man dachte, der Schrank kommt einen entgegen, wenn man es wusste, war aber alles ok u d der Rest hat auch wie gewünscht funktioniert. Danke, gerne wieder. Agréable séjour en famille à Prague. L’appartement est confortable et bien équipé. Sa situation est parfaite pour visiter la ville à pied.